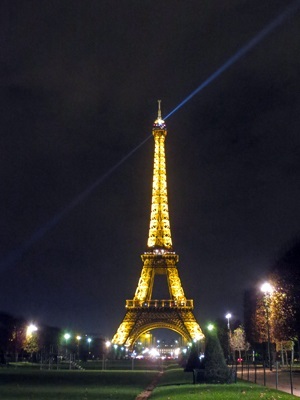 PARIS, FRANCE – We knew Paris in December would be much cooler than Paris in June. This time Paris’ high temperature barely reached 40° F, while on our previous visits in summer we experienced highs around 70° F. And we knew we’d see barely half the hours of daylight we enjoyed in June. But we assumed there would be a corresponding benefit of smaller crowds. It didn’t turn out that way. We boarded France’s justifiably renowned TGV in Lyon for the 300-mile trip to Paris, arriving almost exactly two hours later. It was faster, more comfortable, more scenic and far more convenient than flying, in this instance. We traveled with Janet’s sister and a friend, but opted to do our own “Paris extension,” rather than sign-up for AmaWaterways’ offering. We wanted to set our own schedule, plan our time and select our accommodations. Though a fair number of our fellow voyagers aboard AmaDagio did sign-up for the extension, others we spoke with headed home or, like us continued with their own journeys. Our first full day in Paris dawned bright and brisk, so we walked the approximately one mile from our lodging at the comfortable, convenient and friendly Duquesne & Eiffel Hotel, to the Eiffel Tower planning to take the ride to the top—something we had never done in any of our previous visits to Paris. Although we arrived near opening time, several hundred people had already queued-up to purchase tickets to the lower level platform. And getting to the top was out of the question—they were taking reservations for three months later! We hadn’t imagined demand could be so great this time of year. We did take advantage of the season by shopping the large Christmas market, set-up in tents along the lower Champs-Elysees. We also window shopped in the Galleries Vivienne & Colbert off Rue des Petits Champs. Nearby, on Rue Coquillere we located the premises of E. Dehillerin, a nearly 200-year-old shop that says it’s “Le specialist du materiel de cuisine,” the kitchen store. If you enjoy cooking, don’t miss this place with narrow isles lined with copper cookware stacked to the ceiling. Revisiting some of our favorite Paris museums, including l’Orangerie, d’Orsay and the Louvre allowed us to stay warm on chilly days, though these deservedly popular places were thronged with summer-sized crowds. Even the comparatively small Cluny Museum, dedicated to the Middle Ages, seemed crowded on our first-time visit—but we loved the temporary exhibit on travel. 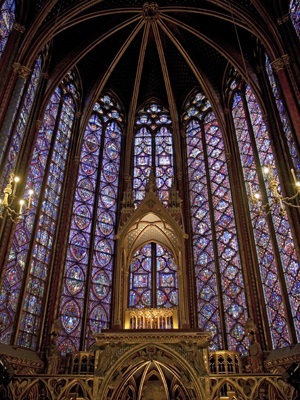 We also took the opportunity to revisit the monumental Notre Dame de Paris and the more human-scale, and in our view even more inspiring sacred space, Sainte-Chapelle. Here, some of the luminous stained glass windows were undergoing renovation, but the pale sun managed to radiate through south-facing panels, bringing a warm glow to the space. 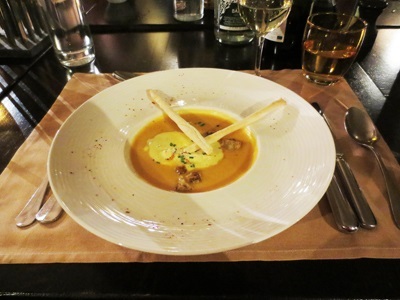 Some of our most memorable Paris experiences involve food. A celebratory farewell dinner with six traveling companions was arranged by our friend and travel agent, Donna, at Restaurant Pasco, a few blocks from our hotel. Here our group dinned around a large table in a loft overlooking the main dining area. Janet’s squash soup, and “chocolate cake & ice cream,” and Stu’s Osso Buco proved highlight dishes. We celebrated Stu’s birthday twice, once on his actual birthday, and again the following evening. Another short walk from our hotel brought us to La Florimond, a small, warm, and inviting neighborhood restaurant on Rue de la Motte Picquet, where we had dined on a prior visit to Paris. We were greeted like long-lost cousins and enjoyed a relaxed and delicious meal. The next evening we took a taxi to Bistoy Les Papilles on Rue Gay Lussac near Luxembourg Gardens, for an unforgettable dinner. We had made reservations via e-mail before we left home, deciding to come a day late because the place is closed Sundays and Mondays. The proprietor greets his guests and describes the evening’s meal. Here, in a narrow, crowded space, one entire wall lined with wine bottles, you eat what is served. The soup and main course are served family-style, brought to your table in a tureen or on a platter. Our table of four nearly devoured a huge platter of slow-cooked pork breast with small white beans and winter vegetables. It was a bit far and way too cold to walk back to our hotel, but the exercise would have done us good. Next morning we reluctantly boarded our flight home and reflected on our nearly three-week European sojourn. It’s difficult to imagine how it could have been much better. We savored three vibrant and welcoming cities, and cruised the Rhone River in comfort, tasting and learning about wine and food of the region. We were most impressed with AmaWaterways and the crew of AmaDagio. The guides and experts we met on our excursions exceeded our expectations. We wouldn’t hesitate to do another river cruise with this company.